□ For a tornado to be considered for categorization, it must have caused at least one fatality and it must have occurred after 1970. 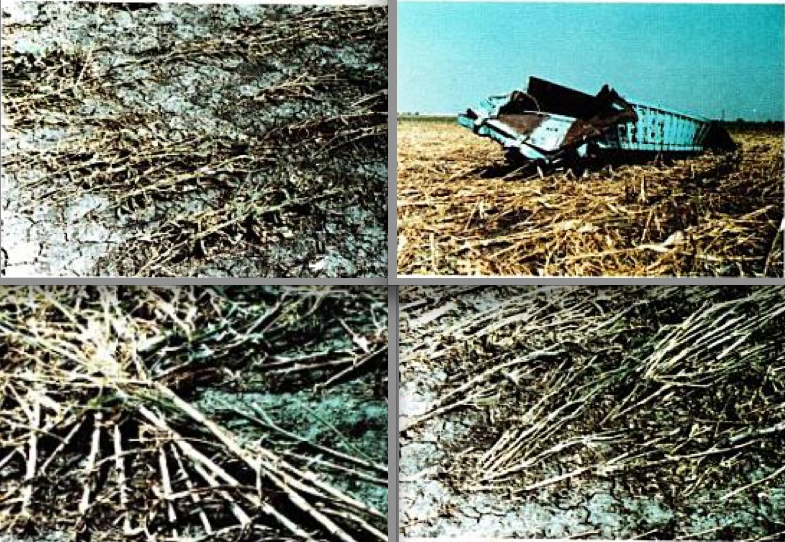 While an accurate list is impossible to compile, objectivity is attempted through the use of damage photographs and first-hand survey reports. 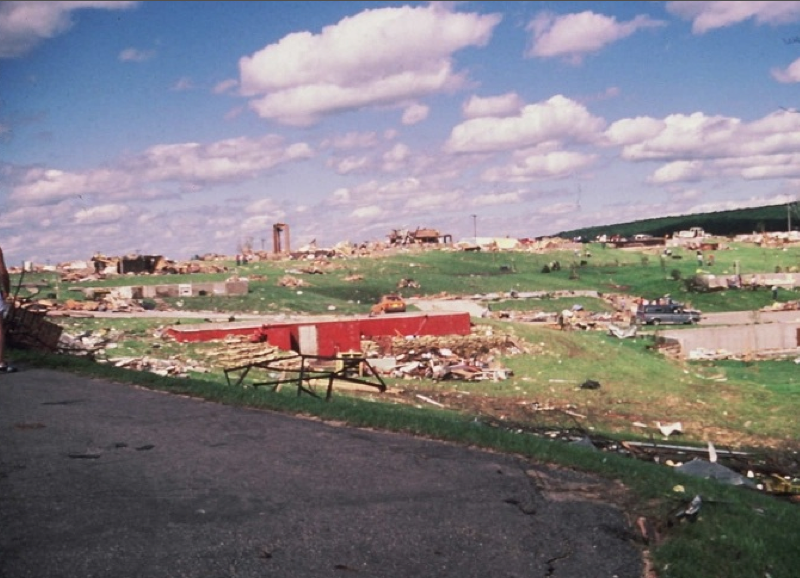 The 1995 Kellerville tornado is not included in the “strongest” list because it caused no fatalities. A detailed report of the damage, however, concluded that “the Kellerville tornado was one of the most violent ever surveyed” and was undoubtably capable of causing F5 damage. Vegetation in the tornado’s path was “completely scoured, leaving bare soil.” Asphalt was also stripped from roads, and trees were snapped a few inches above ground level. 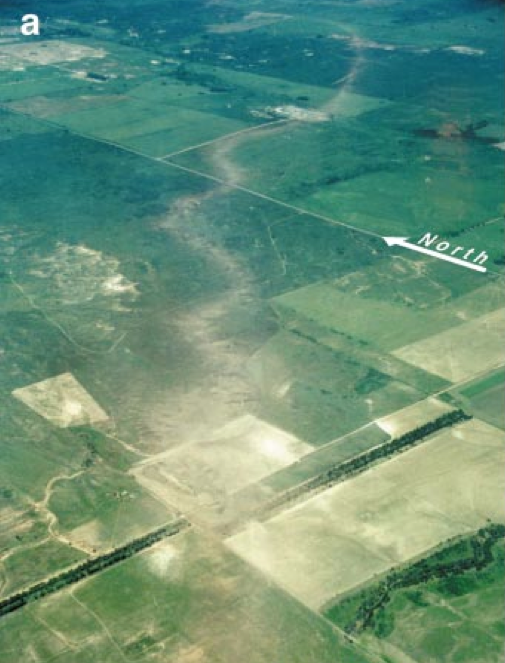 An unusual feature of the storm was its wobbly, non-linear path – a damage feature that had not been documented before in a violent tornado (Wakimoto, Murphey, Bluestein, Dowell, 2003). 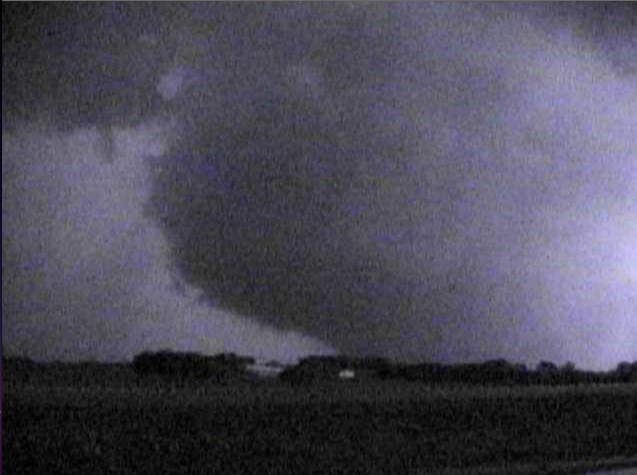 Image of the Mulhall tornado from the Doppler On Wheels. 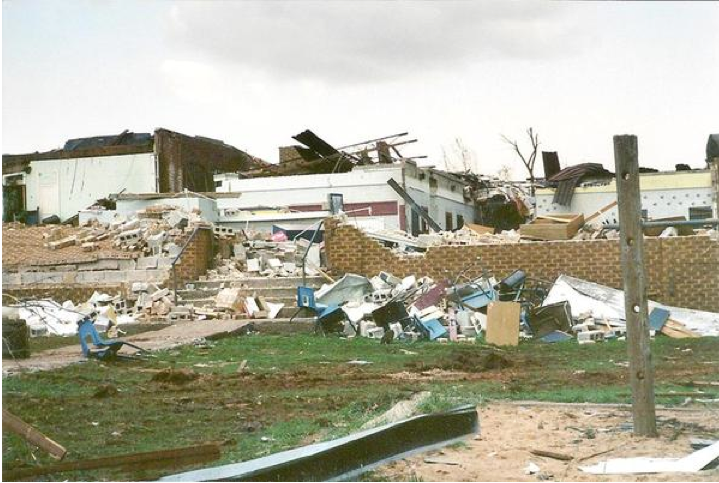 □ The May 3rd, 1999, tornado outbreak is infamous for spawning a devastating F5 tornado that thundered through Bridge Creek and the Oklahoma City suburbs. Peak doppler velocities analyzed in the storm were estimated at 281 – 321mph, the highest ever recorded. Many are unaware, however, that another powerful tornado was analyzed by the Doppler On Wheels later that evening north of Oklahoma City. While peak velocities were somewhat less intense than the Bridge Creek tornado, the incredible size and duration of the winds meant that the storm was potentially capable of causing even more extreme damage. The tornado touched down three miles south of the town of Mulhall just before 9:30pm. Doppler velocities indicated that the storm was exceptionally large early in its development, with powerful winds expanding over an area greater than four miles in width. The monster tornado quickly developed a pronounced multiple vortex structure as it roared northeast at 30mph. Six minutes after touching down, the large tornado passed to the east of the tiny town of Mulhall. As residents took shelter, hurricane force inflow winds blew through the streets, shattering windows and knocking out power. More than a minute later, winds throughout the town increased as the tornado made its closest pass to the east. Debris loudly impacted the sides of houses as buildings disintegrated and cars tumbled in the thundering winds. The town’s water tower collapsed, sending a tidal wave of water that pushed one home off its foundation. A full four minutes later, the winds began to subside. More than three quarters of the town had been destroyed, and some well-built homes on the edge of town were nearly leveled. Outside Mulhall, a woman was killed in the complete destruction of her home. Ten miles to the north, a man was killed when his vehicle was thrown from beneath an overpass on the I-35. Despite the severity of the damage in Mulhall, the town was outside the core circulation of the tornado and on the weaker left side of the storm. Doppler analysis indicated that the highest winds occurred on the eastern side of the tornado as sub vortices slingshotted around the right side of the storm at 120mph (Wurman, Alexander, Robinson, Richardson, 2006). Peak velocities of 246 to 257mph were recorded as the tornado strengthened north of Mulhall, and even higher values were estimated. A ring of winds greater than 185mph surrounded the core of the storm, which had a diameter of nearly one mile (Lee, Wurman, 2005). While ground level winds could not be analyzed, it is likely some locations experienced surface winds greater than 180mph for several minutes. Few, if any damage photographs are publicly available of the areas affected by the core of the storm. The southeast corner of Mulhall, which was more than a mile from the area of strongest winds, experienced borderline F4 damage. Considering that the tornado peaked in intensity well north of Mulhall, it is almost certain the storm was capable of causing a wide swath of F5 damage. Photographs of the vehicle in which a fatality occurred. Wind damaged grass is visible on the hillside near the destroyed car. The center of circulation passed a mile west of this location. In the midst of a multi-day severe weather outbreak across the Great Plains, a large funnel descended from the sky in Grady County, Oklahoma. News stations in Oklahoma City interrupted regular programming to broadcast footage of the tornado as it turned towards the city’s southern suburbs at 30mph. A rare tornado emergency was issued for the metropolitan area just after 3pm. The large tornado traversed eight miles of sparsely populated countryside before entering a period of rapid intensification a mile east of the Canadian River. Homes in wealthy subdivisions just west of Moore were swept completely away as the tornado thundered through the area, leading to five fatalities. Powerful winds engulfed an area greater than a half-mile in diameter, but the worst damage was confined to a narrow streak less than 80-yards wide. Within the worst affected areas, vegetation was ripped from the ground and large trees were shredded into featureless trunks. The tornado was likely above the EF5 threshold as it crossed Western Avenue and ripped through Celestial Acres and other equine sports facilities, killing approximately 100 horses (Kuruvilla, 2013). Nearby, a 20,000lb water tank was ripped from its anchorage and thrown a half-mile, and an oil tank weighing more than 5,000lbs was hurled 1.3 miles (Nye, 2013). 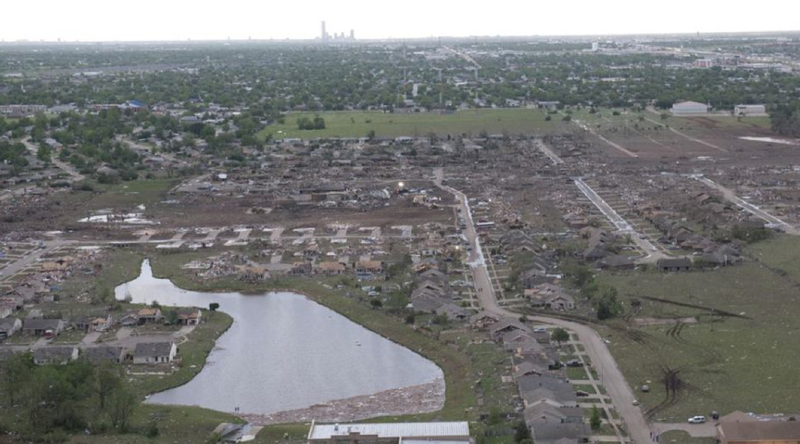 Less than a minute later, the tornado entered the densely populated neighborhoods of Moore. Briarwood Elemenatry School, located at the western edge of town, experienced EF5 damage (NWS, 2013). Several deaths occurred as rows of tightly packed homes were whipped to the ground near Santa Fe Avenue. After crossing over Penn Lane, the tornado may have reached a secondary intensity maxima as it roared over Plaza Towers Elementary School. The school’s well-built concrete walls collapsed in the storm, crushing seven children to death (Kelly, 2013). Just south of the school, six more were killed as an entire residential block was reduced to a checkerboard of bare foundations. Fields in the vicinity of Plaza Towers Elementary were stripped bare and automobiles from adjacent neighborhoods were rolled into twisted balls only a few feet across. Hundreds of homes were leveled to the ground as the storm made a slight jog to the north, narrowly missing a large theatre complex. A 7-Eleven at the northern margin of the tornado’s damage track was obliterated, killing four people who had taken shelter in the store’s walk-in freezer (Chuck, 2013). 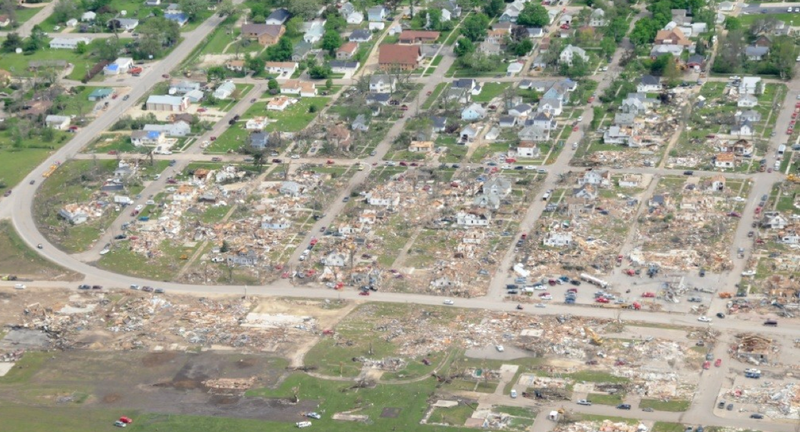 The greatest concentration of EF5 damage throughout the tornado’s path occurred on SW 6th Street, where five well-built homes were reduced to bare foundations (Ortega, Burgess et al., 2014). The storm then made a sudden curve to the east, enveloping the Moore Medical Center and nearby businesses. Cars in the medical center’s parking lot were hurled through the air and stacked like leaves against the building’s walls, but no fatalities occurred in the complex. After crossing the I-40, the tornado abruptly narrowed but maintained extreme intensity as it tore a streak of destruction through eastern Moore. Four separate homes, each in a different neighborhood, were destroyed in EF5 fashion between Broadway Street and Sunnylane Road (Ortega et al., 2014). Approximately 40 minutes after first touching down, the tornado roped out and dissipated near the shores of Stanley Draper Lake. The Moore tornado caused extreme vegetation damage in areas just west of the city. Large trees were completely debarked or sheared just above ground level in a swath often only 30 yards wide. Near Western Avenue, the tornado left a streak of scoured earth only 50ft away from bushes with relatively little damage. 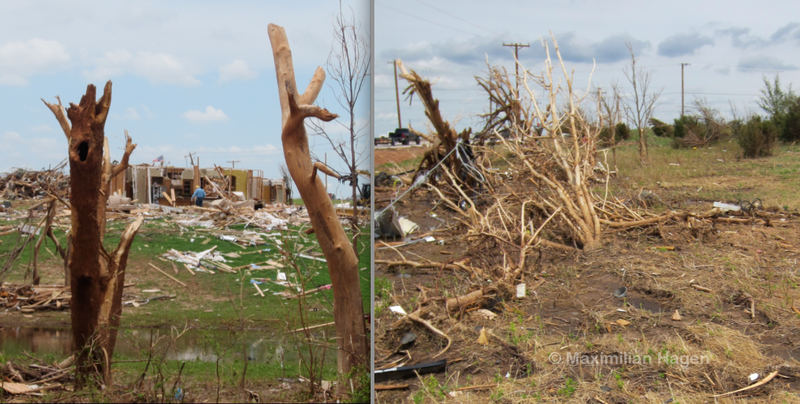 Two views of EF5 home damage in Moore. 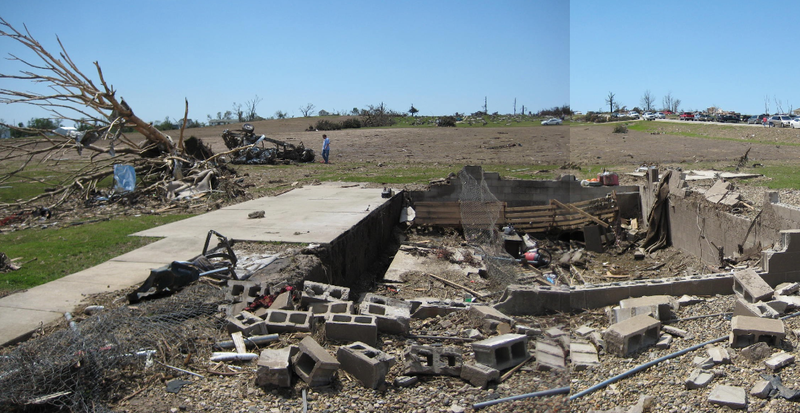 At left, a row of five well-constructed homes near the Moore Medical Center was obliterated At right, a large, strongly anchored house was reduced to a clean foundation at the eastern edge of Moore (Ortega et al., 2014). Despite its impressive reputation, little information is available on the Guin tornado. Most of the photographs used in this article were taken from this video by ABC 33/40. As the 1974 Super Outbreak drew to a close in the Ohio River Valley, a series of powerful supercells erupted in the nighttime sky over the Deep South. Around 8:45pm, a large tornado touched down near the Mississippi/Alabama state line and rapidly roared to the northeast. Like most intense tornadoes in the South, the storm was exceptionally fast moving and buried within sheets of torrential rain and hail. Hundreds of trees were felled each second as the tornado ripped through sparsely populated sections of Lamar County. The tornado reached F5 intensity as it crossed into Marion County, devastating several rural homes before reaching the small town of Guin. 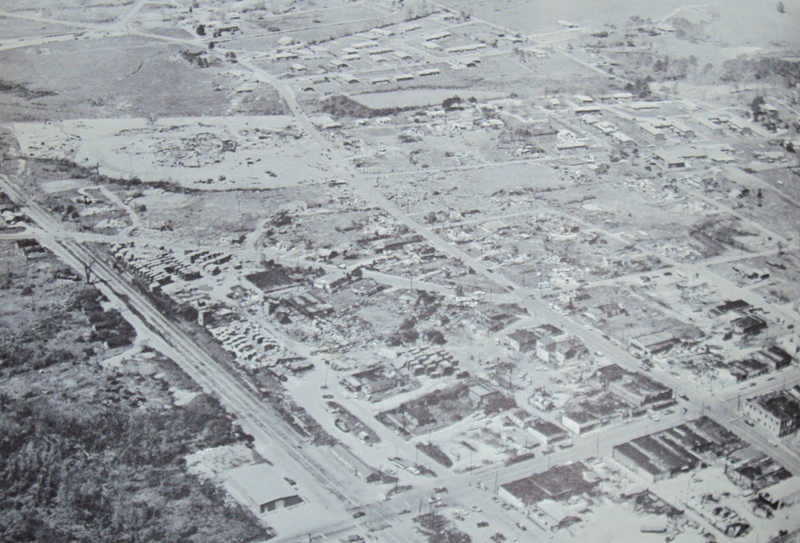 Homes and businesses within a 300-yard wide swath were reduced to bare concrete slabs. According to former NWS forecaster J. B. Elliot, “even the foundations were dislodged and, in some cases, swept away” *(ABC, 2006). Survivors described a very sharp line separating the worst damage from adjacent homes that were relatively unscathed. Most of the debris from Guin was blown to the northeast and wrapped around debarked trees. 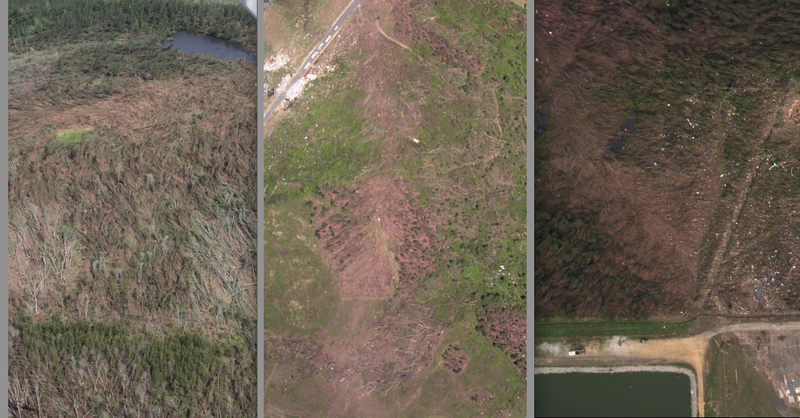 After exiting Guin, the tornado plowed through the William Bankhead National Forest, leaving a well-defined streak of damage that was later photographed by satellites. The tornado weakened as it approached Lawrence County and finally lifted near Decatur after traveling just over 100 miles. Most, if not all of the damage and fatalities occurred in the tornado’s first 40 miles on the ground. Tom Grazulis lists 20 deaths in Guin and 30 overall, whereas the NWS shows 23 fatalities in Guin and 28 total. In recent years, the intensity of the Guin tornado has become a frequent topic of conversation on severe weather message boards. Many of the extraordinary claims (including that Prof. Fujita considered an F6 rating) appear to have originated from meteorologist J. B. Elliot, who surveyed the damage in Marion County. Little photographic evidence exists of the destruction in and around Guin, so little objective information is available to either verify or disprove personal accounts. The tornado was undoubtably a historic event, but no solid evidence exists that indicates it was any more intense than the EF5’s that struck Alabama in 2011. Brick homes were swept completely away on the west side of Guin. 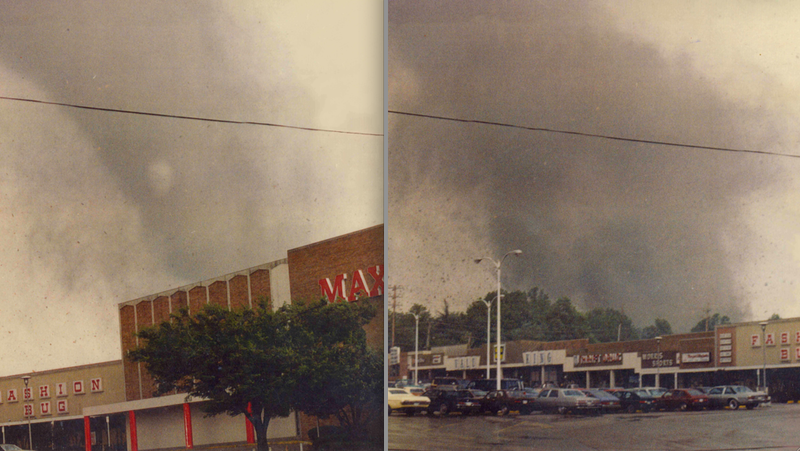 According to Tom Grazulis, the tornado was one of the most intense in Alabama’s history (circa 1991) and caused F5 damage both before and after striking Guin (Grazulis, 1991). 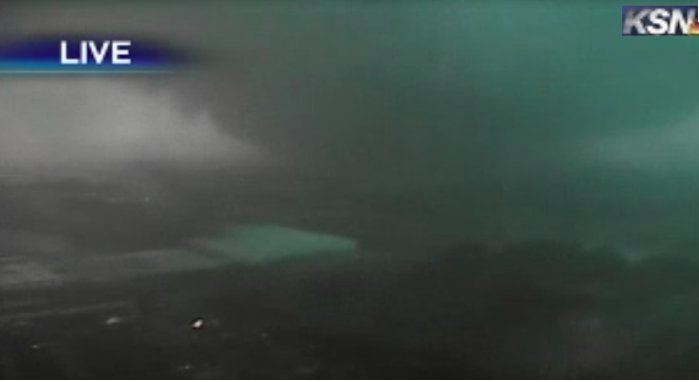 View of the Joplin tornado as it tears through the city at EF5 intensity. □ On a stormy afternoon in 2011, the city of Joplin, Missouri, was struck by the most catastrophic tornado in modern history. In only twelve minutes, the exceptionally violent storm killed 158 people and destroyed more buildings than any single tornado since 1925. 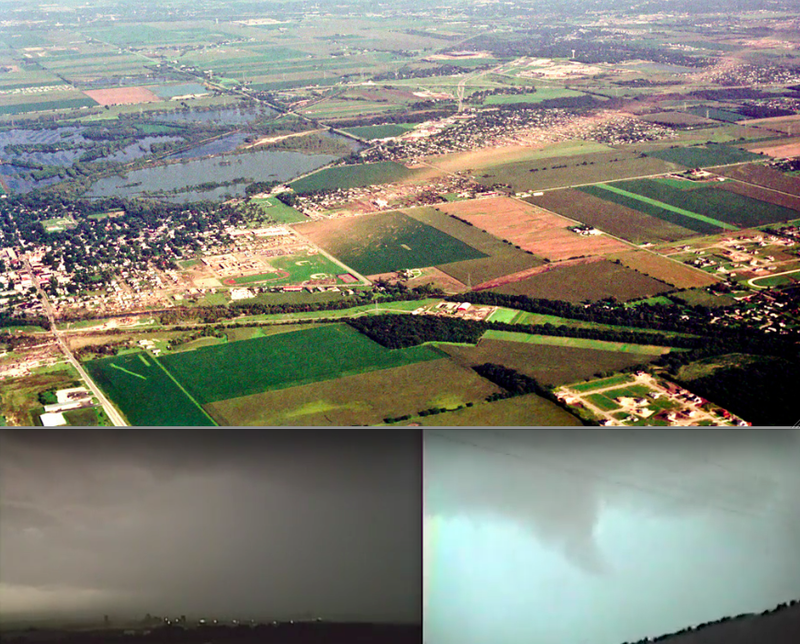 The event was a meteorological worst case scenario; the nearly mile-wide tornado rapidly intensified moments after touching down on the western outskirts of a densely populated area. Within five minutes of touchdown, the tornado was causing EF5 damage. The tornado began its trek across the southern half of Joplin around 5:40pm. Storm chasers photographed the ragged funnel as it entered the city near the Twin Hills Country Club. The rapidly intensifying tornado soon became rain-wrapped and indistinguishable to those in its path. A damage survey indicated that the tornado widened and developed a pronounced multiple vortex structure moments before engulfing St. Johns Hospital. The large, ten-story medical complex was devastated by the storm, and survivors reported that patients in the ER were “sucked out of windows into the parking lot” (Sulzberger, 2011). The extreme inner core of the tornado, which passed just north of the hospital, was powerful enough to rip pavement from a parking lot and hurl thousands of cars long distances, reducing many to unrecognizable balls of twisted metal. One tractor trailer originating from St. Johns was shredded to its frame and wrapped around a debarked tree. Surveyors later noted that the tornado uprooted 300lb cement parking stops, which had been tightly anchored into concrete. A wind engineer concluded that such damage required winds of at least 205mph. Taking into account the friction from densely packed homes and businesses, winds of 205mph or greater only inches above the ground easily indicates significantly stronger winds a few yards higher up. 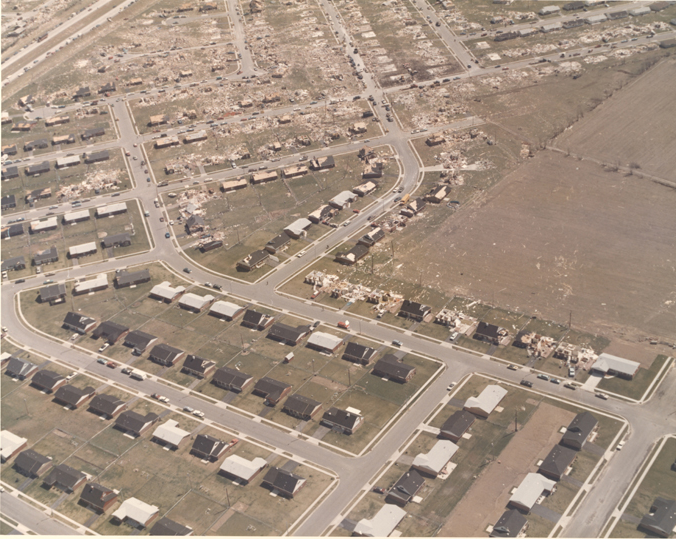 As the tornado continued eastward past St Johns Hospital it completely swept away brick homes along 20th Avenue. Trees and low-lying shrubs in the area were stripped entirely of bark and branches, and patches of grass were scoured from exposed hillsides. Just before roaring over Moffet Avenue, the tornado obliterated the Greenbriar Nursing Home, leading to 21 fatalities. The swath of EF3+ damage increased to a half mile in width as the tornado obliterated businesses on Main Street, and hurricane force inflow winds enveloped more than 200 city blocks. 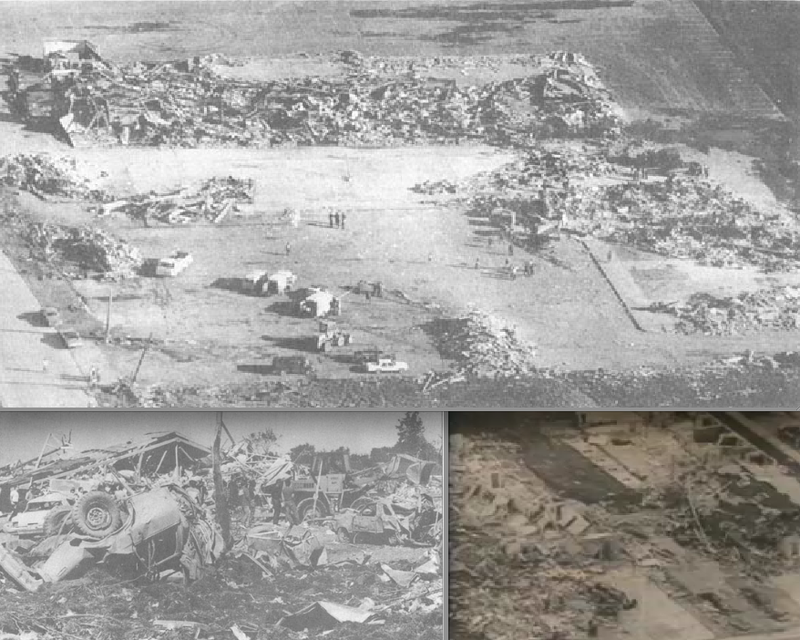 Entire neighborhoods of one and two-story frame homes were flattened and swept away as the tornado roared past Joplin High School, killing dozens. East of the high school, several three-story apartment buildings were nearly leveled to the ground, and sections of concrete curb were shattered and blown away from roadsides. The tornado maintained EF5 intensity all the way to Rangeline Road, where it obliterated businesses and large department stores. Five people were killed after being torn out of a walk-in freezer at a Pizza Hut, and another eight perished in the destruction of a Home Depot. Surveyors later documented large sections of pavement that were scoured from parking lots near Home Depot and Walmart. As the storm continued eastward, it passed over an industrial area, leaving large warehouses as empty concrete slabs. Dozens of 18-wheeler trucks were hurled more than 300 yards and pronounced wind rowing occurred as debris was blown across Duquesne Road. In southeast Joplin, the tornado weakened but continued leveling buildings until it crossed the I-44 and swirled into a rural area east of the city. 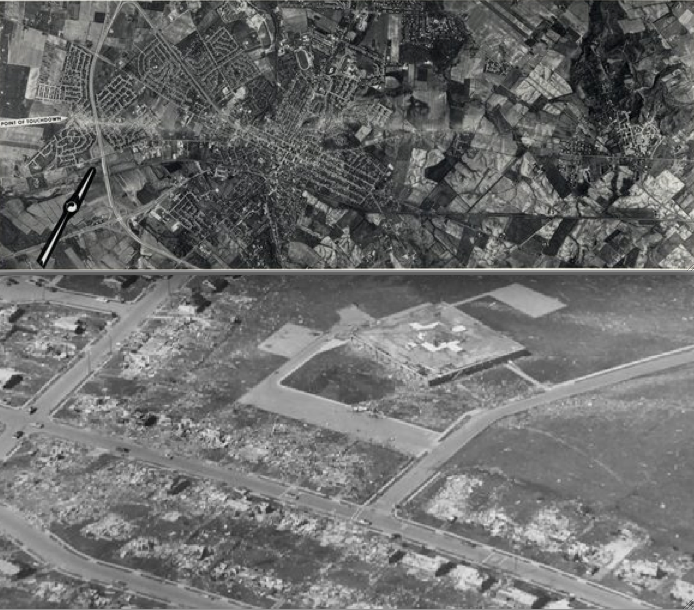 When it was all over, more than 7,000 buildings lay in ruins. Video evidence suggests that most of the extreme damage was caused by incredibly powerful suction vortices rotating within the main funnel. 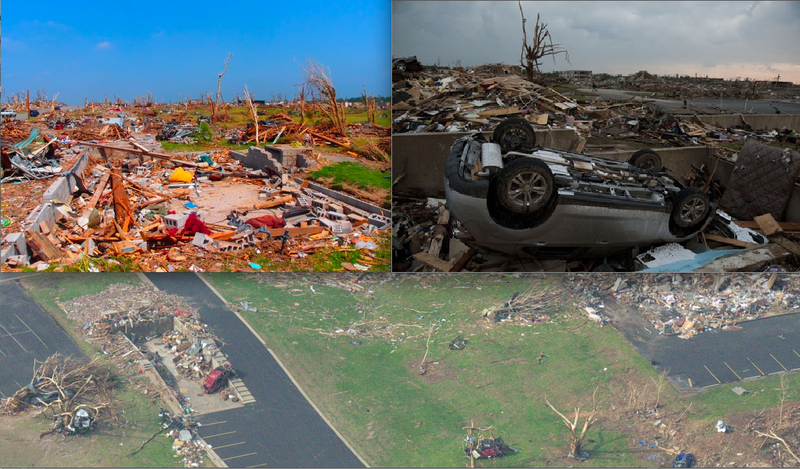 The severity of the destruction was all the more impressive due to the density of structures in the tornado’s path, which would have added significant ground level friction. A more thorough entry on the tornado can be found here. 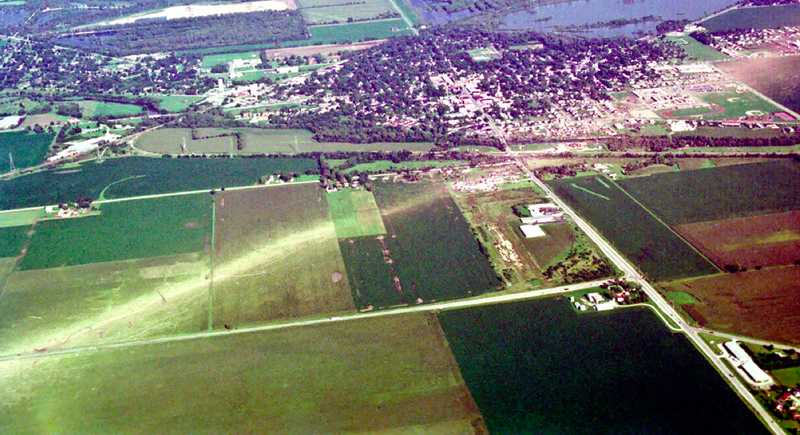 Aerial view of EF5 damage along Iowa Avenue, where there was a high concentration of fatalities. 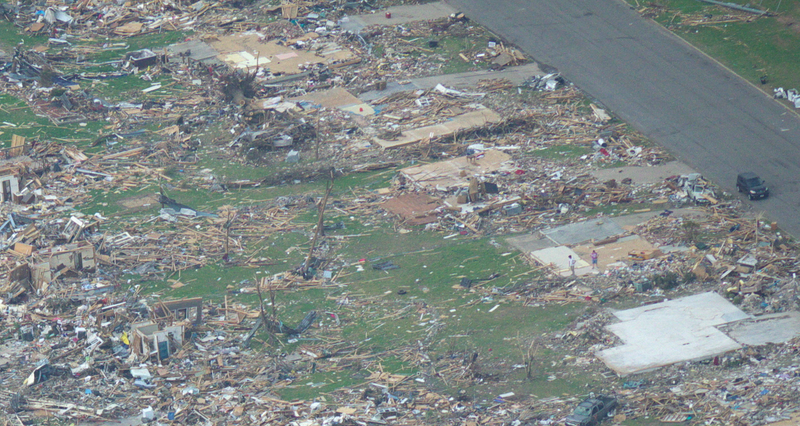 Many of the homes that were swept away were well-constructed. Survey images taken the day after the tornado confirm that these homes were swept away by the tornado and not clean-up crews. Views of EF5 damage along 20th Avenue. The images at top show how, in some cases, even taking shelter under a heavy table in a basement was not entirely safe. At bottom, aerial view of trees that were stripped completely bare. 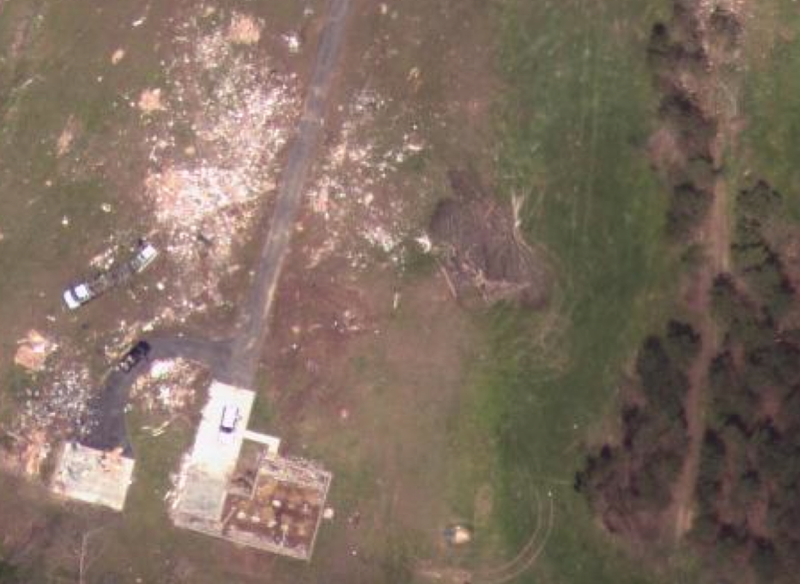 Vegetation damage in Joplin was noticeably more intense than vegetation damage in some other EF5 tornadoes, such as the Greensburg tornado of 2007. Aerial view of extreme damage to large businesses and warehouses surrounding Rangeline Road. A defined trail of wind damaged grass marks the streak of worst damage. At left, a close view of two parking lots that were scoured of pavement. At top, the Walmart parking lot, and at bottom, a parking lot 100 yards to the east of the devastated Home Depot. □ During a wide-scale severe weather outbreak across the Great Plains, a massive tornado touched down in the cornfields of central Iowa. 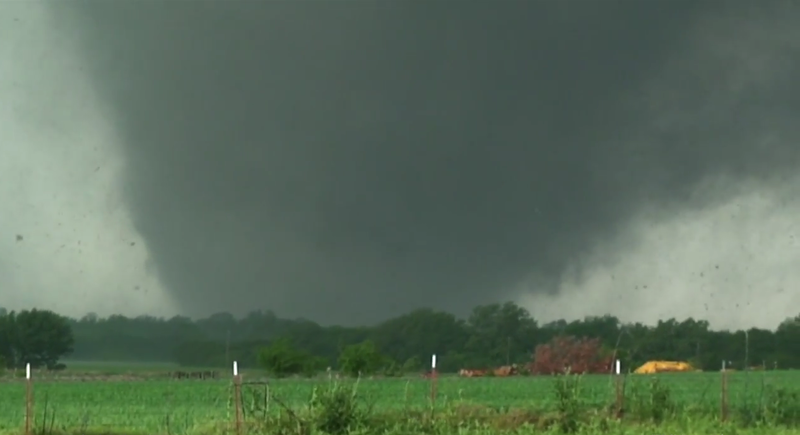 The wedge tornado quickly reached EF4 intensity as it thundered to the east over open farmland. 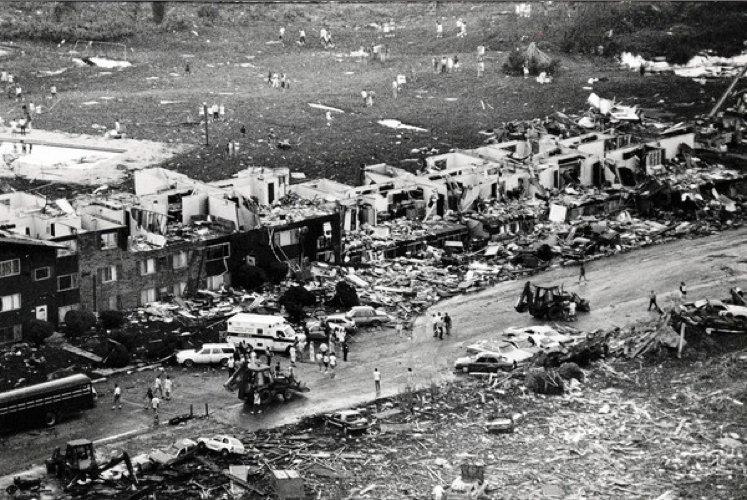 Only a few minutes after forming, the intensifying tornado ripped through the small town of Parkersburg, killing seven people. 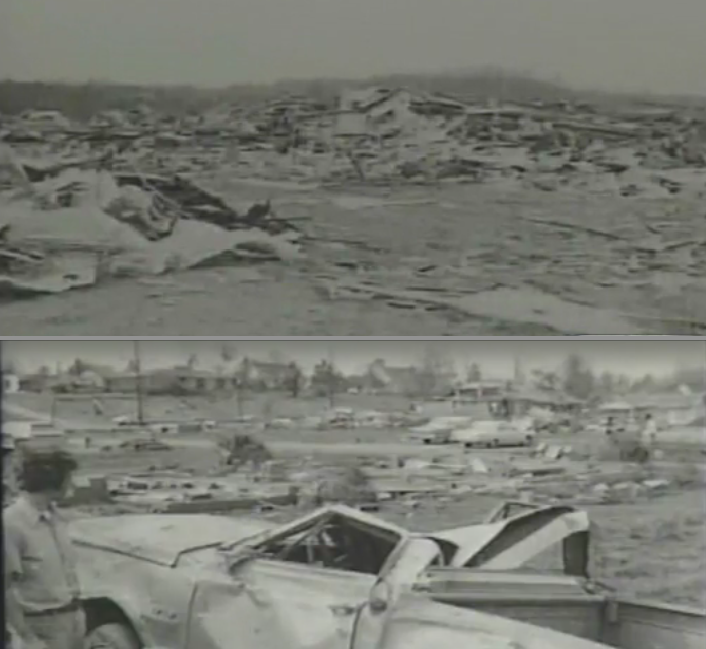 The entire southern half of town was leveled, and more than 100 homes and businesses were obliterated. According to the town’s mayor, Bob Haylock, “most of those killed in Parkersburg were in basements” (NY Times, 2008). 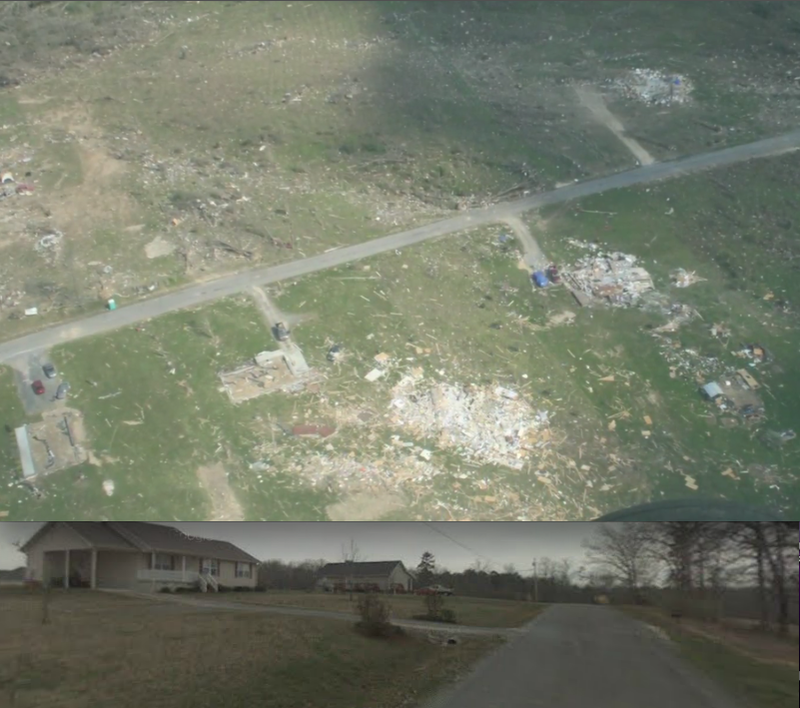 Many of the destroyed homes were swept completely away, floorboards and all, exposing people who had taken shelter underground to the full force of the tornado. 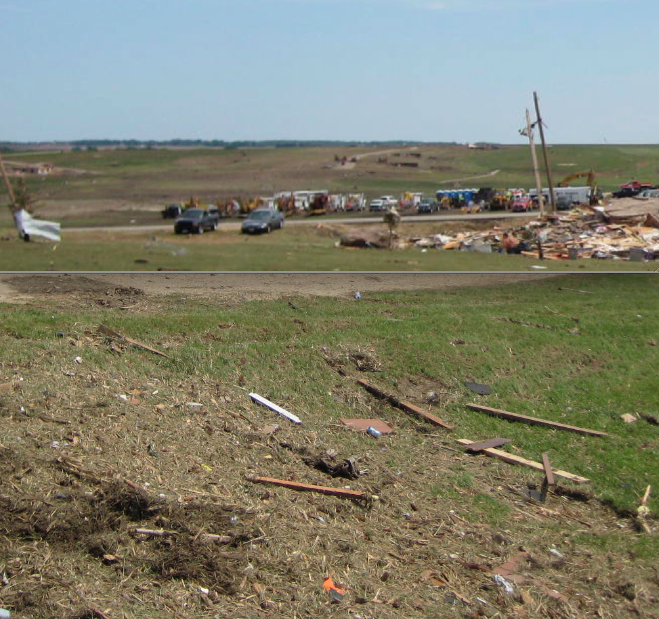 Another indication of the tornado’s exceptional power was the presence of finely granulated debris throughout the damage swath (NWS Survey, 2008). Photographs reveal that much of the material from devastated buildings in Parkersburg was ground into tiny pieces the size of woodchips and deposited east of town. 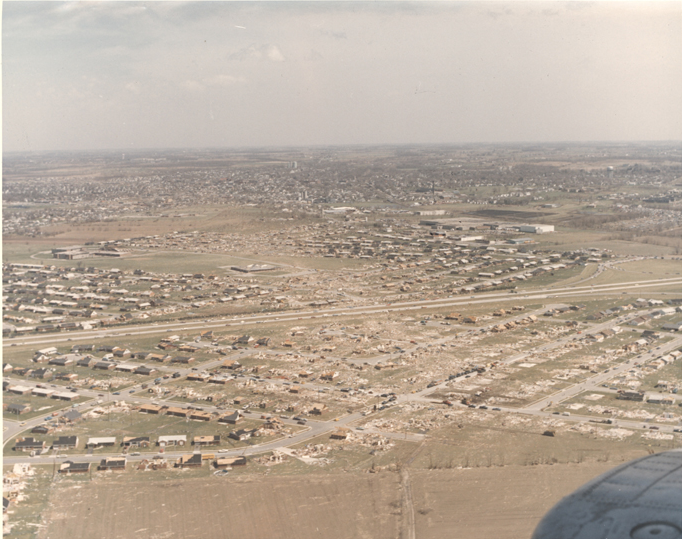 The EF5 damage contour commenced on the southwest edge of town and continued intermittently for the next ten miles. Aerial photographs suggest the tornado was approaching peak intensity just east of Parkersburg as it passed over a golf course. Grass in the area was partially scoured from the ground and well-constructed homes were swept completely away. Surveyors also documented thick, well-anchored basement walls that were undermined by the tornado’s incredible winds. As the tornado continued eastward it maintained its strength and size. By the time the tornado reached a rural housing subdivision north of New Hartford, it was likely at peak intensity. Two more died as several homes were reduced to empty basements plastered in mud and debris. Trees in the area were completely debarked and cars were hurled long distances and mangled beyond recognition. The Parkersburg tornado passed only a few miles north of downtown Waterloo. 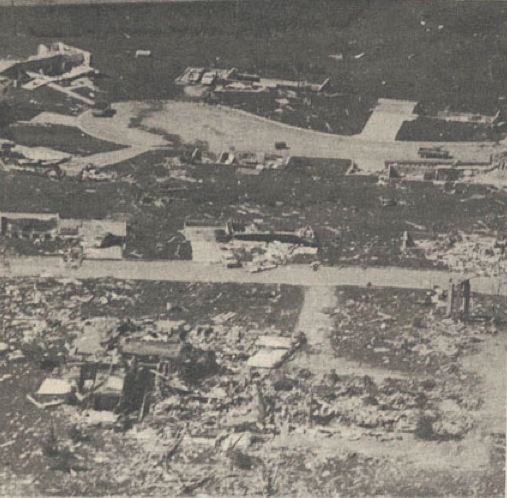 Had the tornado tracked slightly farther to the south at EF5 intensity, the number of destroyed homes could have topped 3,000. The destruction in eastern Parkersburg and New Hartford solidified the EF5 tornado’s place as one of the most intense in modern history. 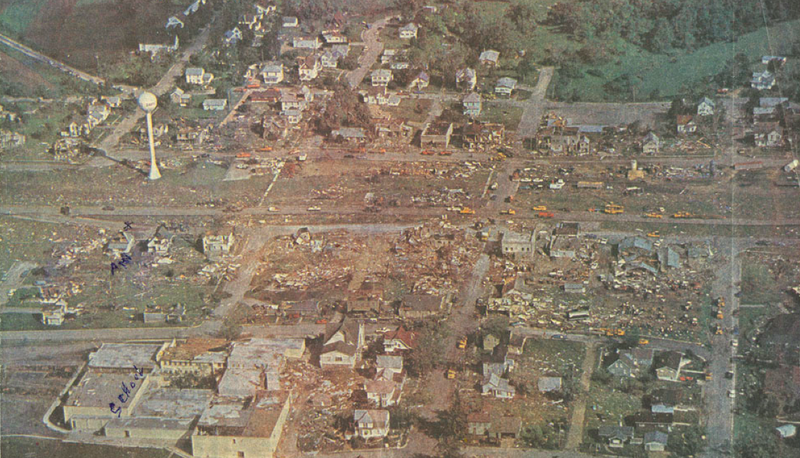 Aerial view of extreme damage in Parkersburg. 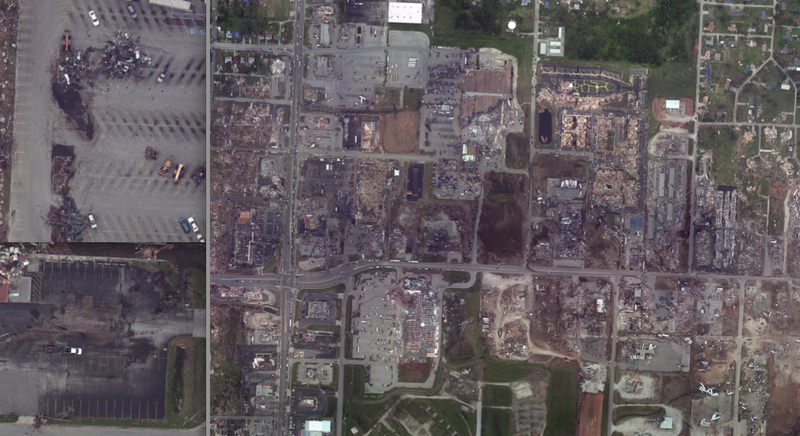 The damage to the industrial buildings at lower left was deemed to be of EF5 intensity (NWS Survey, 2008).